My fifteenth birthday was the worst day of my life, and it's inconceivable to think that any single day in my future will ever be as bad. My mum was killed in a freak accident on her way to pick up my cake. Even when there was still no sign of her after two hours later, and my friends started to arrive at our house, it never occurred to me that she wouldn't be coming back. That was six months ago. My mum died without telling me who my real dad was. And for a while I hated her for it. I thought she's taken the secret of my father's identity with her forever. But she didn't. Holy hell, she didn't. Because three weeks ago I found out the truth. And I'm still reeling from the shock of it. My dad is none other than Johnny Jefferson, mega famous rock star and one-time serial womaniser. And now I'm on my way to LA to meet him and his family. I was excited about this book release ever since Paige announced she is going to write a Young Adult book about Jessie Jefferson, the unkown daughter of rock superstar Johnny Jefferson. If you have not read any books by Paige Toon yet, you need to know one thing first. 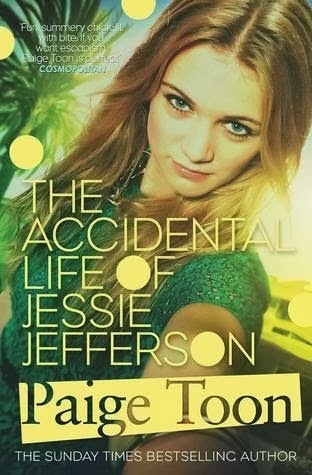 There are three books before The Accidental Life of Jessie Jefferson. I advise you to read the books in the following order: Johnny be Good, Baby Be Mine, Johnny's Girl and The Accidental Life of Jessie Jefferson. It helps you to understand the storyline and the characters much better. With all my concers, Paige proofed me so wrong. She can write stories for young adults too! As an adult Paige Toon fan you have to be prepared for something different. In my case I needed a bit to get used it but once I was hooked I finished the book within two days. I loved it! You did an amazing job, Paige! Jessie is living a pretty normal life with her mom and her stepdate in England. On her 15th birthday she lost her mom because of a tragic and freak accident. Now living with her stepdad who also the maths teacher at her school, she is rebelling against everything. Drinking, smoking, staying out late and getting involved with the wrong people. One thing has been bothering her all her life. She wants to know who her real dad is. Jessie’s mother never told her who he was. After her mother's death she pressures her stepdad into telling her. Then she finds out the truh that Johnny Jefferson is her biological father. Jessie's world is starting to turn upside down. She is off to meet Johnny and his family in LA. Two different worlds are colliding together. Can Jessie manage all the life changes and will she ever feel a part of Johnny and his family? The story is very well written and paced. The characters are so well described. It took me a bit to sympathise Jessie because she was such a brat in the first few chapters. She's developing during the story. I love how Jessie is turning from a rebelling teenager to a mature girl and how she adapted to all the changes to her world. I also loved this book because it gave me a chance to read more of Meg, Johnny and their kids. I truly love Johnny. He is the best character Paige ever created! I really liked how Jessies and his relationship developed. Can't wait to see how their story goes on! The end is prefect but you always want more. I was like "OMG, THIS CANNOT BE THE END, I NEED THE NEXT BOOK RIGHT NOW!" I can't wait for the next Jessie book in 2015!